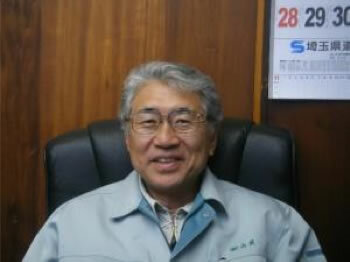 Hi, I am Mr.Nishiyama, the president of our company. I would like to introduce heat- exchange coating “TOUGH COAT”and air- catalyst “SELFEEL.” These products can help reduce consumption of electric power during summer and winter. The issue today is that we rely heavily on nuclear power, and there is concern about the sudden rise in the price of kerosene. Environmental problems have been always in my thoughts, what is good or bad for human bodies. If we say “environmental problems,” it sounds exaggerated. However, I believe it is simply what is good or bad for human bodies. substances (Volatile Organic Compounds (VOCs)) harmless and 2) it helps reduce consumption of electric power. These are done by applying a heat-exchange coating on roofs, outside house walls, and paved surfaces of parking lots. Do you know that the top cause of death for Japanese is lung cancer? What is causing so much lung cancer today? I believe this is due to the air, which we breathe in and out for 24 hours on a daily basis. The air contains toxic substances. A large amount of VOCs, which are created by humans, are in the air. It is said that the number of chemical subsistence that humans have created is 25,000-30,000 (this number is about 4 years old). My goal is to decompose toxic substances for human bodies and make it harmless. SELFEEL makes a catalyst reaction wherever air exists. It keeps decomposing toxic substances and　making it harmless. Please look at my smile! This is from SELFEEL. It would not be exaggerating to say this: SELFEEL gave my health back to me. Moreover, it is the heat-exchange coating that helps reduce energy consumption. The way it works is very different from a heat-barrier coating and insulation coating. Please look at our homepage and contact us with any questions. We would be more than happy to serve you with our best. Motto To serve you by supplying products that are non-toxic, harmless, eco-friendly and to help our customers become more aware of being Green-Consumers and Green-Purchasers.